there's something about jumpers that makes me feel like a 5 year old. not that i was wearing a lot of jumpers at age 5, but that's just the feeling i get. they're so much fun, comfortable, easy to wear and playful. i've been complaining a lot about the cold weather lately and now that it's finally hot and sunny (well, now it's too hot to be honest) this is the perfect thing to wear. 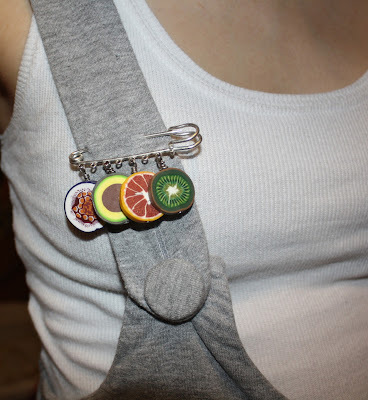 to add a bit more playfulness to the ensemble i put on my fruit earrings and brooch. i'm a sucker for all things handmade and it never hurts to support the local artists. i gave specific instructions for the fruits i wanted on my brooch, and they are some of my favorite, so i have: kiwi, orange, avocado and fig. the earrings were a surprise gift and they are a pomegranate and a papaya. will have to take a close up picture of them next time. so this is it, my playsuit for the day. we should all remember to smile at the kid inside from time to time. i know i did. Oh super cute. You look absolutely elegant in this! And that brooch is really cool!